Washington, D.C. -- Indian Law Resource Center sent a letter this week to the United Nations UN-REDD Programme Policy Board raising serious concerns regarding the rights of indigenous peoples in Ecuador. The Government of Ecuador is presenting a report today to the UN-REDD Programme regarding its progress in Reducing Emissions from Deforestation and Forest Degradation (REDD), including projects to incentivize environmental conservation by indigenous peoples. What the government won’t likely mention is that just this month it announced a new round of petroleum concessions that would open up close to 3 million hectares of indigenous peoples’ ancestral territory to oil and gas development, including lands engaged in REDD projects. 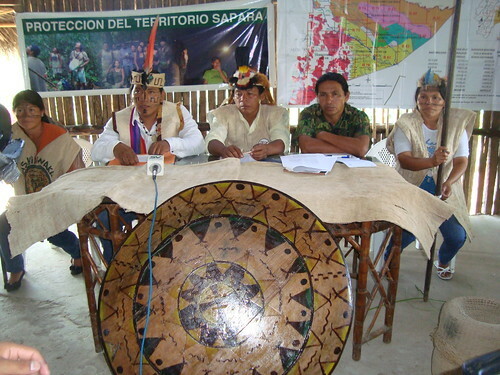 Leaders of the Shuar, Achuar, Shiwiar, Sápara and Kichwa people have rejected any presence of petroleum activities on their territories, citing the threat this brings to their rights and environmental and cultural integrity. Indigenous peoples have criticized the Government for moving forward with the concession process without their free, prior and informed consent. The Government has set November 28th as the date to start accepting bids from international and private oil companies. See below the letter sent by the Center and statements from indigenous organizations in Ecuador.